It's smiles all round at Shielfield on Saturday as Berwick Rangers were convincing winners over Annan. A hat-trick from Steven Thomson, taking his tally for the season to 10, helped Berwick to a welcome win over Annan at Shielfield. Thomson netted twice in the first half, to give Rangers a 2-0 lead, before completing his treble with a 30-yard strike with the very last kick of the game. 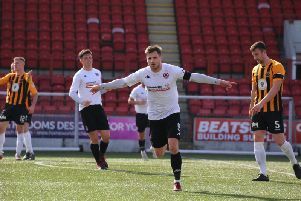 Jordan Orru also scored for Berwick in the 86th minute, after Peter Weatherson had pulled a goal back for Annan from an indirect free-kick inside the area. It was only Rangers’ third win in their last 15 games but was enough to lift the Borderers two places up the table into seventh. Berwick, who had signed five players during the January transfer window, gave a debut to goalkeeper Devlin Mackay, while Euan Spark played his first game at home at full-back, with Dutch pair Renne Donkor and Ricardo Kessells and striker Aaron Murrell on the bench. As early as the third minute Nathen Flanagan brought out a good save from Mackay, but Rangers replied with Greg Rutherford heading narrowly wide from a cross by Lee Hamilton. Mackay also collected safely from a Rabin Omar header following a corner, but Berwick took the lead after 13 minutes when leading scorer Thomson forced the ball home from close range after Annan failed to clear a cross from the left by Spark which fell into the path of Rutherford and was blocked. In 19 minutes it was 2-0 when Thomson scored again, his shot taking a deflection after Rutherford broke through the middle. Seven minutes later Annan pulled a goal back when Peter Weatherson netted from a free-kick which was awarded inside the area after Mackay handled a passback. McKinley was forced to leave the field after 34 minutes after picking up a knock and was replaced by Orru, and seconds later Blair Currie had to get down well to save an effort from Rutherford right on the line. Berwick got lucky when Annan hit the post and Pat Scullion cleared off the line from Smart Osadolor. After 40 minutes Mackay failed to collect under pressure from Omar, and following a goalmouth scramble the ball ricocheted over the bar. The second half was poor by comparison with neither side able to make any inroads, and it wasn’t until the 60th minute that Osadolor broke clear and pulled his shot across goal that there was any serious attempt at either end. Thomson had a great chance to complete his hat-trick and wrap up the points, but failed to convert properly from only seven yards out, while Rutherford shot straight at Currie. The game was finally made safe in the 86th minute when Orru slammed home a first-time shot at the back post following a cross from the left. And there was better to come when Thomson secured the match ball with a tremendous strike. Berwick: Mackay 6, Spark 6, McKinlay 6 (Orru 33), Scullion 7, Hamilton 6, Phillips 6, Thomson 8, Lavery 6, McKenna 7, Rutherford 6 (Kessells 90), Sheerin 5 (Murrell 76).